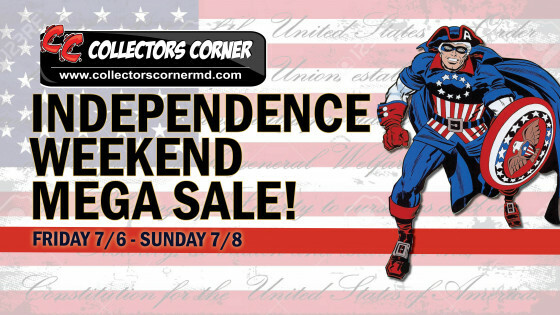 CC Independence Weekend Mega Sale! 50% Off ALL DC & MARVEL COMICS HARDCOVER Graphic Novels Priced 24.99 or more Excluding New This Week. 40% Off ALL ACTION FIGURES, TOYS, STATUES & FUNKO DORBZ, POPS, VYNIL & Sealed BLIND BOX Figures Not Dated within 30 Days. Free Hot Dogs & Bottled Water 12 Noon - 3PM. SATURDAY Only GIFT CARD BONUS (ALL 3 Stores) - SPECIAL BONUS GIFT CARD OFFER On Saturday 7/7 : Purchase a $100 CC Gift Card for Later at any CC store Location on Saturday 7/7 and get an additional $50 Bonus Added for a Total of $150. This Offer Valid Only on Saturday 7/7. Gift Card in whole or in part may not be Redeemed on Saturday 7/7 or Sunday 7/8, VALID for Use on or after Monday 7/9. No Expiration. Limit 2 IW Bonus Gift Per Customer, While Supplies Last. Fill A Long Box for $75 or Fill 3 Long Boxes for $200.